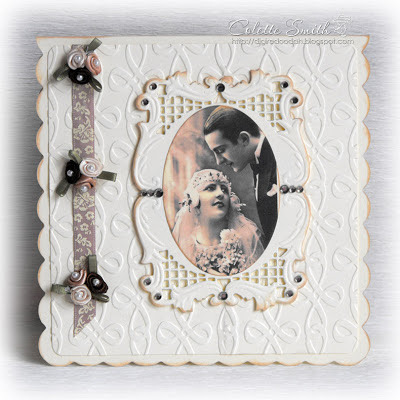 Here's a card I made using the gorgeous new satin rosebud trios, I thought the brown, gold, ivory combo would be perfect with the vintage image. Today's card is made from a ready to print kit from Paper Creator. I've added a few punched flowers and die cuts leaves, lace from stash and then all that's needed to finish it off is some lovely Meiflower embellishments. 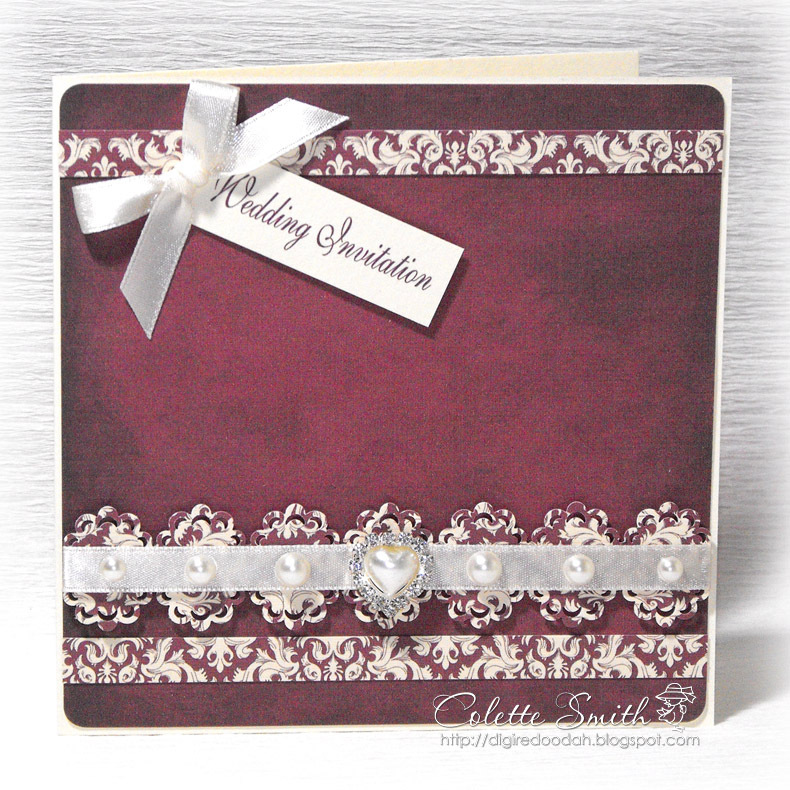 For this card I have used wide satin ribbon, polka dot satin ribbon, stick on gems and a Love charm. 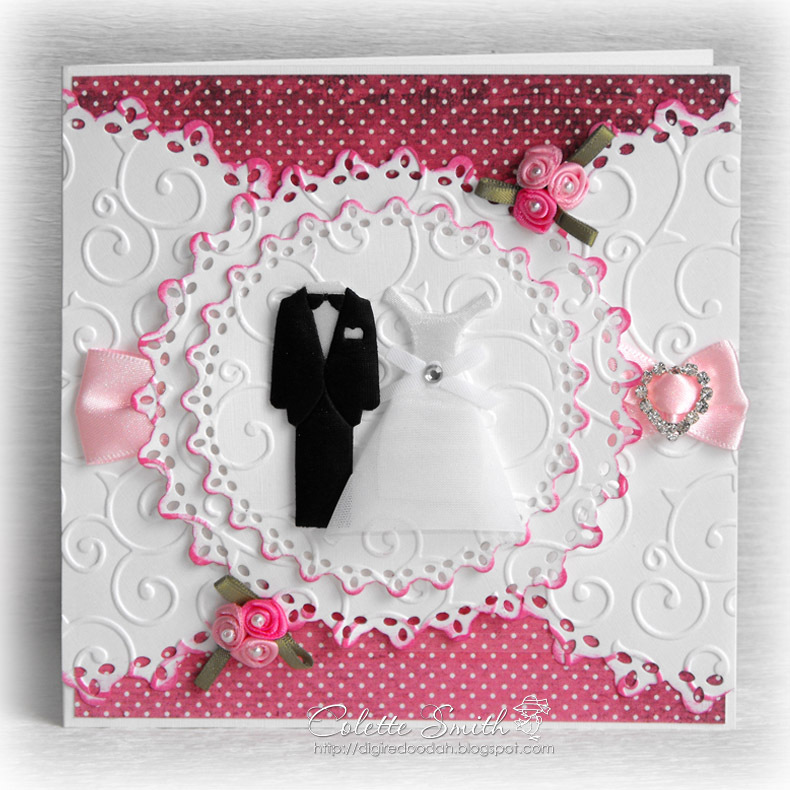 Here's a quick card I made using stuff from my scrap box, a die set and Meiflower ribbon, Diamanté slider, Rosebud trios and a Bride and Groom embellishment set. 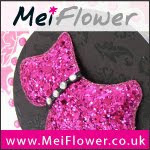 Meiflower have a great selection of ribbons and embellies, that are just perfect for wedding cards. I have used a fabulous My Bestie digi stamp, coloured in photoshop for this card, and then made a looped bow with jade green satin ribbon and cerise pink polka dot satin ribbon, threaded through a gorgeous small diamond shaped diamanté buckle - all from Meiflower. I have added Meiflower crystal stick on gems to the doily and foliage to finish it off. The sentiment circle is available as a freebie on my blog. 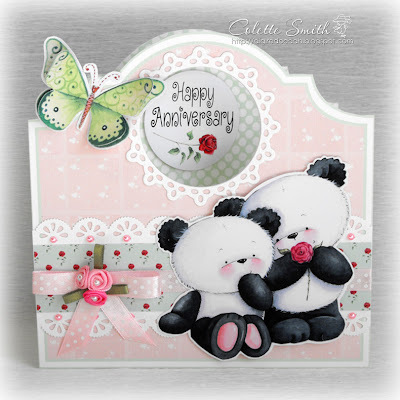 Here is an 8x8 sized card i have made using a digi image from funkykits .I used papers from dovecraft,coloured her with promarkers,the edge punch and butterfly sizzlits die are both from SU.The swirls are memory box dies,The flowers are from mulberry crafts.the ribbon and pearls are from meiflower crafts. Meiflower have lots of lovely diamanté embellishments which are just perfect for wedding invitations and on this card I have used one of their newer ones, it's a pretty heart shaped pearl surrounded by crystals, I also used mixed size stick on pearls and ivory satin ribbon. The heart embellishment is not available on-line yet, but you can always phone your order through if you want some. I have made this card using papers from Trimcraft floral pavillion 8x8 paper pad,the image is from funkykits and is a digi.the mulberry flowers are from wild orchid.the ribbons and gems are from meiflower crafts. The frame is a die from crafters companion diesire range,the sentiment is from craftwork cards and the lace is from my stash.I coloured her with promarkers. I have made this card using an embossing folder from crafters companion diesire range,the snowflake embossing folder is from cuttlebug,the ribbons and gems are from meiflower crafts and the image is a LOTV stamp. 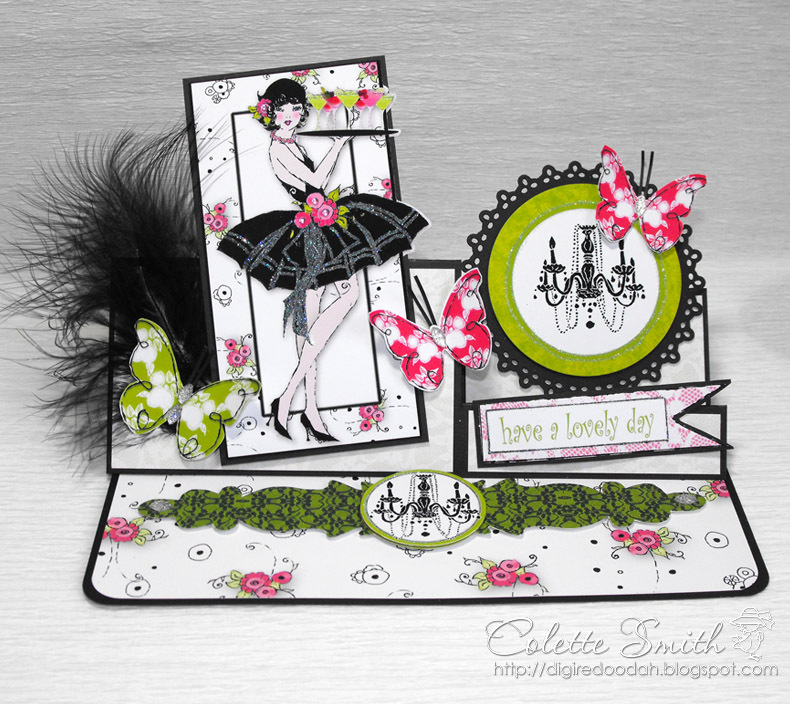 I love the dazzlers from Meiflower, and on this card I have used the cats eye dazzlers to make sparkly bodies for the butterflies and to embellish the ends of the easel stopper, there are also a few tiny Meiflower stick on gems in the centres of the flowers on the dress and hat. You can find the template for this card on my blog. 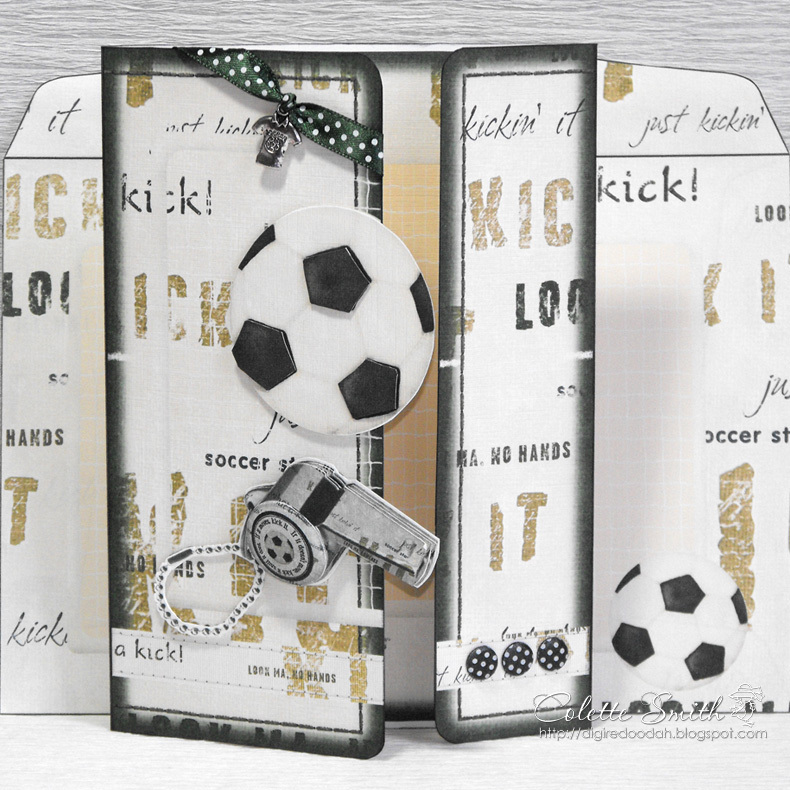 I have used one of the fab football shirt charms available from Meiflower on today's card, (which is a kit from Paper Creator), they are perfect for adding a little something to a football themed card, they have the word soccer and a football engraved on one side and on the other they have the number 9 (useful if you are making a card for a nine year old). You won't find them in the on-line store yet, so would have to phone your order through if you wanted some, but you can pick them up at any of the craft shows that Meiflower attend. 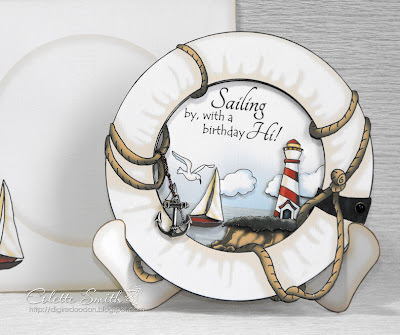 I have also used green Polka dot satin ribbon to hang the charm from and some black and white polka dot buttons, but you could use ribbon and buttons in the colours of the recipients favourite team to make it a bit more personal. Meiflower have some gorgeous new Satin ribbon Rosebud trios, and I have used on of them on today's card along with polka dot satin ribbon and pink stick on pearls. The rosebuds also come in a brown, cream, gold colour scheme and I will be showing them off on another card I've made in a couple of days. 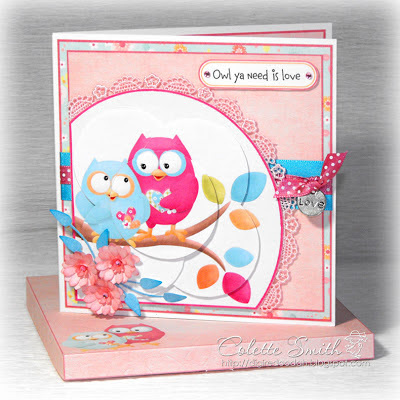 I have used the Party Paws Paper Crafting CD for today's card. How cute are those panda's?! If you want the rosebuds you will have to phone your order through as they are not on the website at the moment. 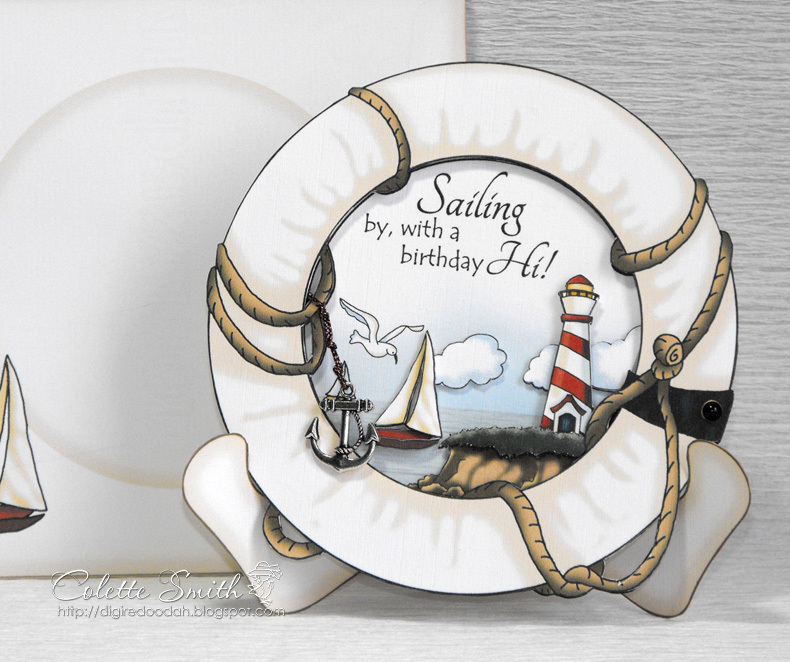 I wanted to show you this sail boat plate card I made using a kit from Paper Creator, once put together it needed something to finish it off, so I attached an Anchor charm to some brown metallic cord, knotted the cord in a couple of places and then tied it around the rope in the plate design, tucking the ends under the top layer. I also used a black pearl on the lifesaver.